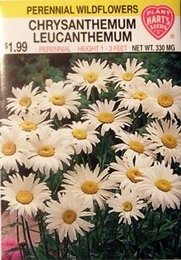 This beautiful Ox-Eye Daisy, sometimes called Field Daisy is a very popular wildflower found throughout North America. The long, graceful stems display their beautiful white blossoms with yellow centers well above the foliage. Plants are adaptable, tolerating moist or moderately dry soil. Wildflowers require little care. Water only when necessary. For additional plants, divide clumps after 2 or 3 years of flowering.